K BAR R Ranch & Arena is owned and operated by Cody and Debbie Rabska. Established in 2009, the ranch currently occupies 3 properties, which includes K BAR R Arena on Highway 64. The home ranch holds the horses, and has an equine breeding lab on site. Both Cody and Debbie have been certified through UW Madison in Equine Reproduction Management for both Mares and Stallions, and handle all aspects of AI breeding of the horses. The Rabskas also work together on the training and showing of their horses, and currently show in both the American Ranch Horse Association, and the American Paint Horse Association. 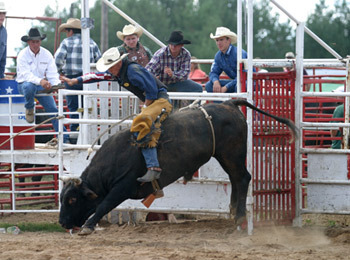 Cody grew up in a rural area and followed the rodeo trail as a bullrider for several years after graduating high school. He then pursued college to complete the electrical contractor course and became a master electrician in 2007. In 2010, Cody started his own electrical business, Gold Buckle Electric, which he continues to operate today. His life goal of being involved in the horse industry prompted him to start the APHA horse breeding program at K BAR R Ranch & Arena, while his passion for the sport of rodeo continues to drive him to promote the sport and provide opportunities for others to keep the rodeo tradition alive. Debbie grew up in Medford, WI on a family dairy farm. After graduating high school, she worked at Tombstone Pizza until 2006 when her and Cody moved to Colorado Springs, CO. There she worked at a veterinary clinic as a receptionist. When they moved back to WI, she was hired at the Medford Veterinary Clinic as office manager, where she continues to work. 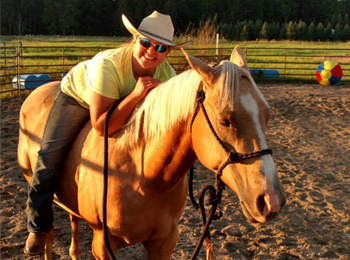 As co-owner of K BAR R Ranch & Arena, Debbie’s passion is caring for the broodmares and foals, and showing their 2016 stallion, GIMME MY MISSION, in APHA and ARHA shows. Her background in cattle led to the start of the Miniature Texas Longhorn herd.